Baptist Medical Center is part of the Baptist Health System in San Antonio and is recognized as a "Solucient 100 Top Hospitals." Located in downtown San Antonio, Baptist Medical Center is a full-service community hospital that offers state-of-the-art cardiac care, including the city 's first robotically assisted cardiac surgical technology. Baptist Medical Center was the first hospital in San Antonio to offer robotically assisted surgery, which for patients means smaller incisions, less pain and faster recovery. 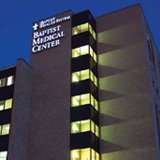 Baptist Medical Center has a strong commitment to the community as demonstrated by the many educational outreach programs it offers, including free health screenings, baby showers, joint seminars, free pregnancy testing centers and other programs. As the most popular travel destination in the state, more than 26 million people visit each year. So it’s possible that if you’re preparing a move to this area, you’re already aware of its many attractions, including sports, culture, recreation, shopping and cuisine. Combine all of these attractions with a beautiful climate and a thriving economy, and you’ll find no better place to call home than San Antonio. One aspect that truly defines the area is the respect for its history, whose traces can be seen throughout the River Walk area and beyond. It’s a city that is comfortable with its diversity and mix of cultures – with more than 58 percent of the population who are of Hispanic or Latino origin. The harmonious mix results in a truly cosmopolitan city, one comfortable with its past but certainly living in the present with an eye on its future. When measuring a city’s quality of life, it’s not just the main attractions but a wide range of factors, including its weather, cost of living, educational access, health care facilities, job growth and overall positive attitude. In San Antonio, you’ll find all of this in addition to the friendliest people and plenty of opportunity to live life to its fullest.